Winder, Georgia – The National Association of Housing and Redevelopment Officials (NAHRO) recently honored Winder Housing Authority with the prestigious 2018 Award of Excellence in Program Innovation – Community Revitalization for the Wimberly Center for Communty Development. The 2018 NAHRO Awards of Excellence winners were selected by regional juries from a pool of this year’s 193 Awards of Merit honorees. Winder Housing Authority was one of only 19 winning agencies. Awards of Excellence programs must improve resident outcomes, resolve problems, and be replicable by organizations of similar size. They must also produce tangible results, such as cost savings, enhanced productivity, improved client services, and better service coordination. 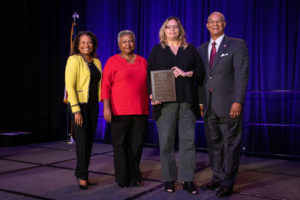 Winder, Georgia – The National Association of Housing and Redevelopment Officials (NAHRO) recently honored Winder Housing Authority with two (2) 2018 Awards of Merit. The winning projects were: Wimberly’s Roots Demonstration Kitchen and Garden in Program Innovation – Community Revitalization and Wimberly Center for Community Development in Program Innovation – Community Revitalization. Wimberly’s Roots Demonstration Kitchen and Garden addresses some of the fundamental challenges facing the community. Classes offered to neighborhood residents, youth, and seniors are designed to educate the community about healthy cooking and food preservation techniques. Food-related resources are available to neighborhood residents and those involved with various groups. Community members gain skills needed to grow their own gardens and supplement their diets with food they grow. Wimberly’s Roots incorporates the outdoors as a classroom, reconnects students with nature and the true source of their food, and teaches them valuable gardening, agricultural and healthy lifestyle skills. The Wimberly Center for Community Development has become the catalyst for Winder’s urban renewal by offering programs and services that are not only needed but necessary to the community. 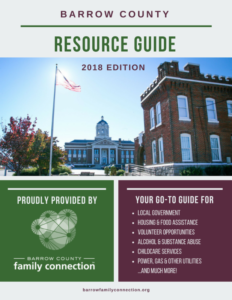 Our state of the art resource center allows nonprofits and governmental agencies the opportunity to collaborate under one roof, reducing overhead and allowing each to focus on their core business. The NAHRO Awards of Merit program was created 19 years ago to recognize agencies who found innovative ways of making a difference in their communities and in the lives of the people they serve by creating affordable housing, revitalizing their neighborhoods, and developing initiatives such as job readiness programs, public-private partnerships, disaster prevention projects, and more. NAHRO, established in 1933, is a membership organization of nearly 20,000 housing and community development agencies and professionals throughout the United States whose mission is to create affordable housing and safe, viable communities that enhance the quality of life for all Americans, especially those of low- and moderate-income. NAHRO’s membership administers more than 3 million housing units for 7.6 million people. Winder Housing Authority’s Mission Statement: “ To promote adequate and affordable housing, economic opportunity, and an enhanced living environment for our community”. Winder Housing Authority (WHA) prides itself on partnering with community organizations to provide resources that our clients need in order to become self-sufficient. These partners include local banks and churches, private sector, nonprofit, and governmental agencies. In 2012, in conjunction with HUD’s ROSS program, WHA established the Family Self Sufficiency Program. 25 families committed to sign a five year contract to become self-sufficient. Through that process, WHA partnered with a number of organizations that bring valuable services to our participants. As we began to work with our partners we realized that it would be beneficial to have as many partners under one roof, for not only our clients and the community, but also for the agencies to be able to share resources, knowledge and build relationships. When we learned that the abandoned Winder Barrow Middle School (WBMS) was up for sale WHA decided that this, along with its adjoining Osborne Park, may be an excellent location for this “ONE STOP SHOP” and some additional workforce or senior housing (mixed income, not public housing). In Jan. 2013, City of Winder’s Urban Redevelopment Plan (URP) was approved, which identified 5 areas of Winder as blighted and needing a facelift. Glenwood was one of those areas. Renovating the school into a resource center was certainly validated. As part of the URP, community meetings and surveys ( provided in partnership with NEGRC) identified after school programs for youth, and home ownership education/opportunities as top priorities. WHA negotiated a contract with Barrow County Board of Education to purchase WBMS and Osborne Park on March 20, 2014. In mid- 2014, City of Winder and WHA partnered up on a $500,000 CDBG application, where the City was the lead applicant. In August 2014, we were successfully awarded the grant for $500,000. During the same time, WHA decided to participate in HUDs RAD program, converting their entire portfolio of PH under HUDs PIH program to PBRA under HUDs Housing-Multifamily Program. RAD allows PHAs to bring in private capital/resources, in order to meet the demands for capital improvements. As of Jan. 2016, all WHA units have been sold to WHA affiliates, and are being operated as project based rental assistance units. WHA is the Mgmt. Agent for these sites. The sales proceeds of the units enabled WHA to purchase the Wimberly Center. On February 2, 2016, WHA purchased the school and adjoining Osborne Park (20 acres total), who’s namesake Mr. Robert Wimberly, a community pillar, served as principal at the school for many years and served on the WHA Board of Commissioners for 15 years. 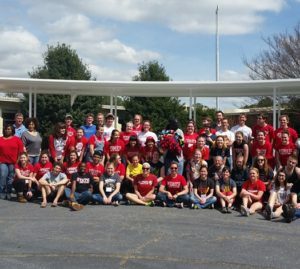 To date, 50 honor students from the Illinois State University have volunteered at Wimberly Center as well as a number of other nonprofit and civic organizations. 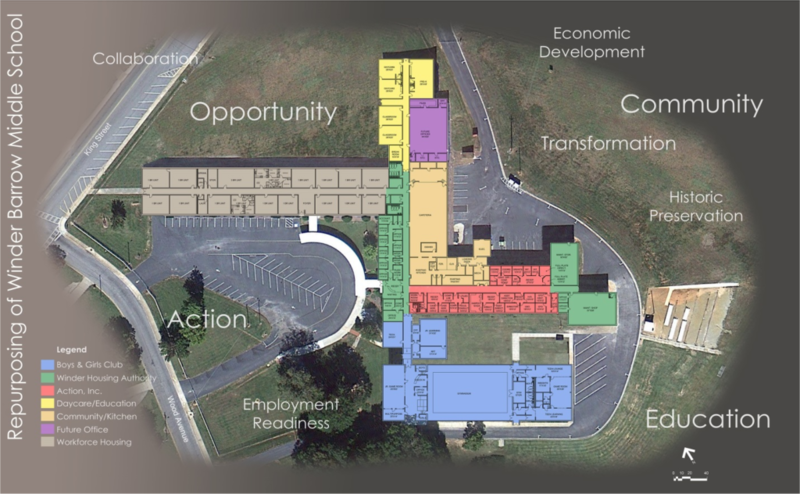 In conjunction with the Wimberly Center, WHA plans to build a senior housing development at Osborne Park property, adjacent to the school, where coordinated activities with the Boys & Girls Club youth and the seniors will be possible. WHA purchased an additional 10 acre tract that will be a future single family site.